A new tool helps estimate ridership and revenue from transit-oriented development projects near Metrorail stations. Download it for yourself! For months we have been detailing our work that quantifies the relationship between land use and rail ridership. This is important because Metrorail has been experiencing large changes in ridership, and we were interesting interested in understanding why certain station areas – like Navy Yard and NoMa – were showing ridership gains while the system as a whole is experiencing losses in the long arc of ridership growth. 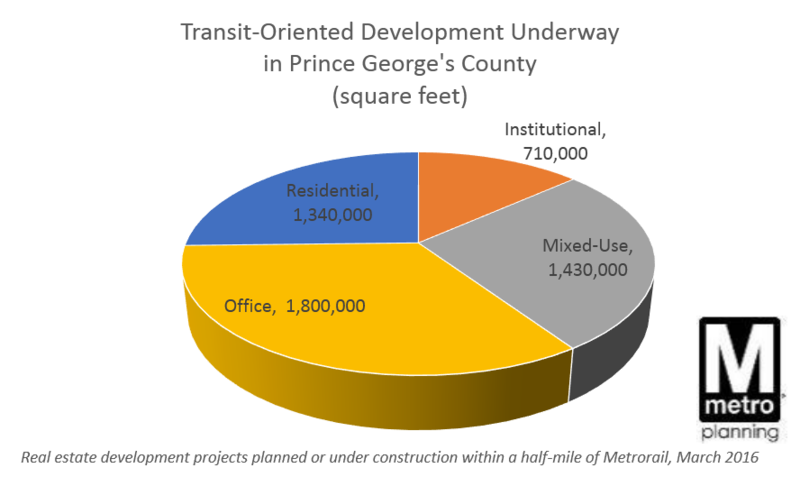 Prince George’s County’s bold new vision for transit-oriented development deserves attention and support! For more than a decade, regional planners and economic development officials have lamented the relative lack of development around Prince George’s County Metrorail stations, and yours truly had opportunities to challenge its leadership to up its game in accelerating transit-oriented development policy and practice more than a few times. On this blog, we’ve highlighted how lack of development has hindered ridership growth from the County, and we’ve articulated the benefits that would accrue to the region if Prince George’s County were to achieve the development potential of its Metrorail stations – in fact, Metrorail might just run an operating surplus if those areas were developed. Now we all have reason to cheer and hope that these challenges and aspirational goals might be more than just wish lists and a hope certificate. 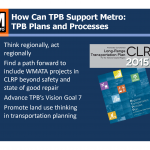 How Can the Transportation Planning Board Support Metro? Metro and the Transportation Planning Board (TPB) engaged in a wide ranging discussion with TPB board members about how the TPB and the region’s jurisdictions can support Metro now and in the future. Not surprisingly, there’s a lot more to it than just predictable funding. At the December 16th Transportation Planning Board (TPB) meeting (audio), Metro Board Member Harriet Tregoning gave the final presentation (pdf) and facilitated a discussion on Metro’s challenges and provided specific recommendations and/or opportunities for the TPB and local jurisdictions to increase their support the Authority today, tomorrow, and into the future. The focus of the discussion was specifically on plans, processes, and actions that the TPB and local jurisdictions can modify or begin that will ensure predictable funding and/or enhanced funding options, incorporate land use as a transportation strategy, increase transit-supportive land use decisions, prioritize bike and pedestrian access, and advance bus priority on the streets that local jurisdictions operate. Secretary Foxx has issued his direction that Metro cannot consider any new rail expansion right now, and WMATA agrees! So much so that we wrote it into our strategic plan back in 2013. Earlier this fall, the Prince William County’s Board of Supervisors heard from WMATA about the importance of fixing Metro’s core before considering any expansion. As the region grows, so does the pressure for extensions of Metrorail. The requests are frequent and common: “Extend Metro to BWI! to Centreville! to Waldorf! to Fort Belvoir!” We’ve heard and even modeled most of these requests. For a system that’s shaped and contributed tremendous economic value to the region, it only makes sense that communities outside of its immediate reach want improved access to it. WMATA Director of Planning Shyam Kannan recently took the opportunity to discuss the potential for the extension of Metrorail into Prince William County. With 80% of today’s Metrorail trips going to or through the system’s core (PDF), he noted that major core capacity improvements must be made prior to considering any additional rail extensions. While addressing core capacity has been a major part of Momentum, including initiatives like the 8-car train program, core stations, and New Blue Line Connections, the plan remains largely unfunded. With safety and state of good repair needs as Metro’s top priorities and core capacity relief put off indefinitely, any potential extensions (if they happen) are likely decades away from being built. For at least the past decade, the region’s real estate has revolved around transit. That is expected to continue for the next decade, and we can already see signs of its impact along the Silver Line, according to a new report. We’ve been highlighting the impact that Metro has on the regional economy for many years now. From the Regional Benefits of Transit study which highlighted the quarter of a billion dollars in incremental tax revenue that the jurisdictions enjoy each year solely because of Metro, to recent data which highlights that almost all of the development pipeline in the D.C. region is within walking distance of Metrorail, it’s crystal clear that this region’s economic future is inextricably linked to Metro. 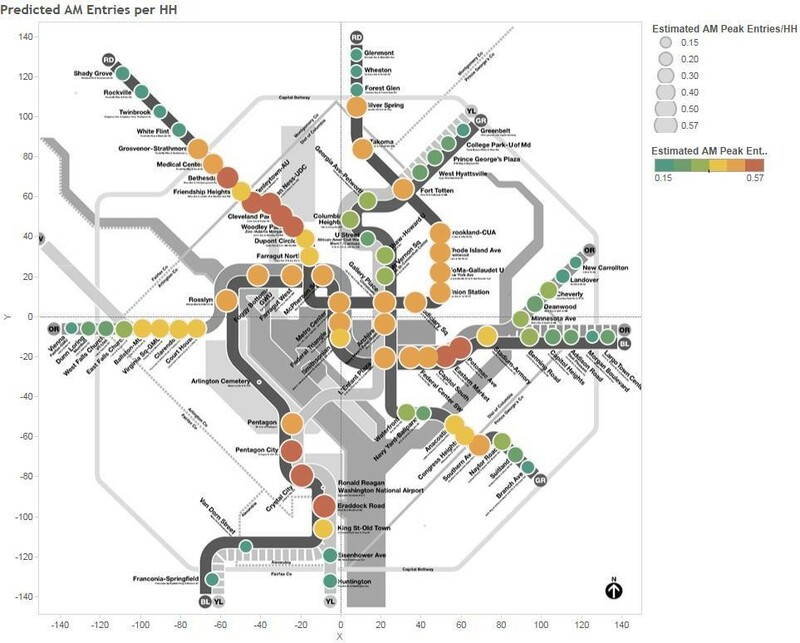 This post is guest-written by Chao Liu, Hiro Iseki, and Gerrit Knaap, researchers from University of Maryland’s National Center for Smart Growth, who helped Metro develop our Land Use Ridership Model. Even though Metro doesn’t control where new jobs and households locate in the region, these decisions are critical to the agency’s ridership and financial future. It is well known that the form and intensity of development in and near rail transit station areas can have measurable impacts on transit ridership. For these reasons, transit oriented developments (TOD) generally feature high-density construction, mixed land uses, and bike and pedestrian friendly infrastructure. But not all TODs are alike, and the effects of TOD on transit ridership are likely to depend on how well the station is connected both locally and regionally, whether the station is near the center or end of a transit corridor, and what kinds of jobs and household are located nearby. To explore how different forms of development might impact ridership on the Washington Metrorail system, Dr. Hiroyuki Iseki and Dr. Chao Liu assisted Metro to develop a direct ridership model (DRM), called Metro’s Land Use Ridership Model. A DRM uses statistical techniques to quantify the relationship between entries and exits at rail stations and land uses nearby. This model can then be used to estimate the number of passengers who will access the station, by waking or biking, as a result of changes in land use features, transit service characteristics, and socio-demographics within the walkshed of any given station. The direct ridership model includes a large number of variables for each station, including the density, diversity, and design of local environment; transit service and connectivity; job accessibility by auto and transit; walk score; the availability of parking; the demographics of nearby residents; the number and types of jobs nearby, and more. The model was estimated for the AM Peak, Midday, PM Peak, and Evening travel periods. The AM Peak model is best suited for estimating the increase in morning boardings that would result from locating more households near the station; the PM Peak model is best suited for estimating the increase in afternoon boardings that would result from locating more jobs near the station. Approximately 86% of the region’s new office construction is occurring within one-quarter mile of Metrorail stations, 93% within the half-mile walk sheds. 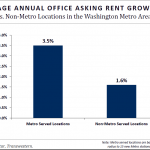 A Washington Post article from October 2013 made a staggering assertion: That 84% of new office construction in the region is occurring within one quarter mile of a Metrorail station, according to Jones Lang LaSalle and other data sources. As we continue to dig into walk sheds and the land-use/transportation connection, we thought we would revisit this assertion and update it for 2015. 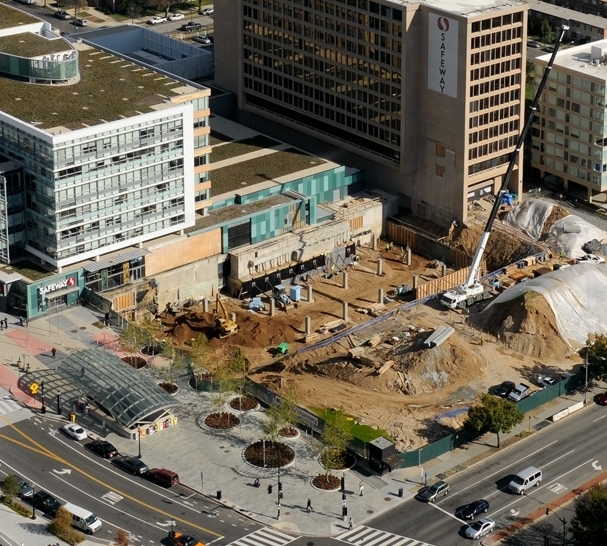 86% of new office construction in the Washington region is occurring within one-quarter mile of a Metrorail station. New office currently under construction in the Washington region. All but four projects are within a half-mile of Metrorail. Data from Jones, Lang, LaSalle. Metrorail Revenue by Station – Visualized! Differences in ridership across stations are bigger than differences in revenue, so ridership is a stronger explanation of differences in revenue than fares. For example, Shady Grove’s average fare in the AM Peak is $5, which is twice as much as the smallest average fare. On the other hand, ridership at Shady Grove is ten times higher than other stations, so the ridership better explains the station’s revenue. In the AM Peak, the terminal stations dominate in terms of revenue contribution. Union Station functions as an internal “terminal station,” meaning that the commuter rail and Amtrak connections to Metro are extremely important to the overall ridership and revenue picture. Other stations with strong bus or commuter park-and-ride infrastructures also pop in the AM Peak, such as Silver Spring and Grosvenor. Note how well the non-Silver line stations in Virginia perform in the AM Peak, as well as the somewhat expected better performance of the Shady Grove branch of the Red Line in the AM Peak. In the PM Peak, the core is king. Stations like Farragut West and North, Metro Center, L’Enfant Plaza are producing $50,000 apiece every evening thanks to their job densities, reinforcing the importance of improving their capacity for the future in Metro 2025, as well as their huge importance to revenue today. By comparison, in the AM Peak, only Shady Grove and Vienna approach these levels of revenue at roughly $40,000 per station. The New Carrollton and Largo Town Center branches of the Blue/Orange/Silver Lines contribute significantly less revenue than other branches, and this directly relates to the relative lack of transit-oriented development along these spines. The station areas on these lines enjoy a superb level of rail connectivity to the region’s primary job cores, but without sound transit-oriented investments to-date, they have not yielded the type of ridership and revenue commensurate with the capital investment. Imagine what Metro’s revenues (and farebox recovery) could look like if these segments were properly developed! We’ve been examining the data ourselves as we continue forward with Momentum’s call for us to ensure financial stability for the Authority and have created the visualization for you to play with. We’d love to know what you see! In Part Two of this series, we forecast the impact of the region’s near-term development pipeline on Metrorail ridership, using the Land Use-Ridership model. The good news? Metrorail ridership is set to show big gains. The bad news? Your ride just got less roomy. Just as we were putting the finishing touches on this post, we saw a flurry of news articles detailing the regional market forces that portend increased rail ridership. Millennials choosing not to drive, even as they grow up. Office parks in far-flung places experiencing devaluations while Metrorail-adjacent areas capturing the lion’s share of new leases. Marriott announcing that it will seek a transit-accessible location when it moves. And even defense contractors coming to bat to argue for the economic benefits of the Purple Line. All of this free publicity set us up nicely for what we wanted to share with you – the first results of the Office of Planning’s Land Use-Ridership model as applied to near-term development projects. The Near-Term Pipeline. Researchers at Jones Lang LaSalle have been compiling a list of actual development projects – under construction, or planned – near Metrorail stations, so that we can forecast the near-term capital needs for the system. A huge amount of development (over 105 million square feet!) is on the books for within a half-mile of a Metrorail station. Station-area walkability is one of the most potent congestion-busting tools in the planner’s bag of tricks. Now we’ve mapped out in detail which stations are living up to their full potential – and where we need to redouble our efforts. We’ve brought to you information about the power of station area walkability. Not only does better station access give mobility benefits to those who most need it, but it also boosts ridership and revenue and therefore lowers Metrorail’s operating subsidy. That means lower taxes for you and me. Metro’s Office of Planning is wiring the science of walkability into WMATA’s Key Performance Indicators. We are committed to working with our partner jurisdictions to improving station area access and identifying the near-term and low-cost improvements that have big returns for ridership and revenue. And we have been working diligently to develop a comprehensive geodatabase of walk sheds and the land uses – existing, planned, and proposed – located within them.